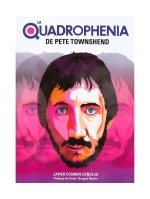 Author Javier Cosmen Concejo has written in Spanish language a book about Pete Townshend's Quadrophenia. The book has 172 pages and was published in Spain in March. Autor Javier Cosmen Concejo hat in spanischer Sprache ein Buch über Pete Townshend's Quadrophenia geschrieben. Das Buch hat 172 Seiten und kam im März in Spanien heraus. 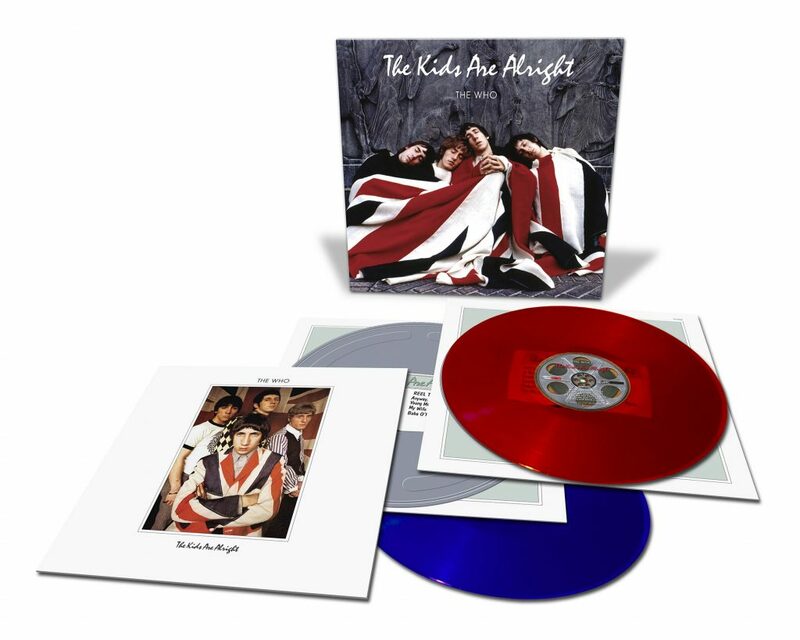 Tony Klinger, renowned producer of The Who's The Kids Are Alright film, has started a PledgeMusic campaign for The Who and I Box Set, Book and Memorabilia. 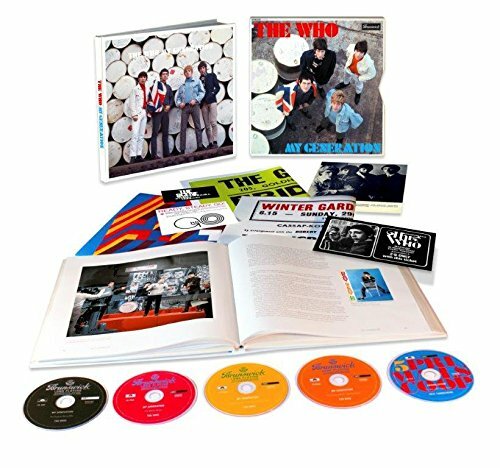 The Box Set contains Tony's new book The Who and I, an audio book / CD, reproduced memorabilia, and a reproduction of The Kids Are Alright press kit and photos. Tony Klinger, Produzent des Who-Films The Kids Are Alright, veröffentlicht sein neues Buch The Who And I. Vorab sind einige verschiedene limitierte Auflagen rund um das Buch auf der Webseite von PledgeMusic erhältlich. This hardcover book is announced to be released in September 2017. On 464 pages it will contain interviews and encounters edited by american author Sean Egan. Dieses Buch ist für September 2017 angekündigt. Auf 464 gebundenen Seiten soll es Interviews und Begegnungen mit The Who enthalten, die der amerikanische Autor Sean Egan zusammengetragen hat. More than 400 fans, friends and colleagues tell their stories of seeing The Who live from the smallest of venues to festivals and arenas. Smashed guitars, twirling microphones, exploding drum kits and a lot of looning from Keith Moon. The fans who were there take you back to an amazing era with personal photographs, memorabilia, fascinating anecdotes and stories that have never been published before. A new stage production of The Who's Tommy is touring through UK between March and July 2017 including venues in Ipswich, Nottingham, Leeds, Birmingham, London and Sheffield. This new musical show has already had many great 5 star reviews and features a new song written by Pete Townshend. Eine neue Musical-Produktion von The Who's Tommy tourt zwischen März und Juli 2017 durch Großbritannien. Mit dem Titel Acid Queen 2 hat Pete Townshend extra für diese Show einen neuen Tommy-Song komponiert. All of Pete's solo albums were already released in remastered versions on CD. Now they are available on coloured and heavy vinyl. 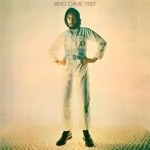 It starts with Who Came First and Rough Boys on 17 February, followed by Empty Glass and All The Best Cowboys Have Chinese Eyes on 17 March and finishes on 14 April with White City, Iron Man and Psychoderelict which is released on vinyl the very first time. Pete's solo Alben wurden alle schon in Remastered Versionen auf CD veröffentlicht. Nun erscheinen sie auf farbigem und 180 g schwerem Vinyl. Den Anfang machen Who Came First und Rough Boys am 17. Februar, gefolgt von Empty Glass und All The Best Cowboys Have Chinese Eyes am 17. März und endet am 14. April mit White City, Iron Man und Psychoderelict welches zum allerersten Mal auf Vinyl herauskommt. This Super Deluxe Edition 5CD box contains 79 tracks including mono and stereo mixes of The Who's first album, lots of bonus tracks and a handful of demos amongst others three unreleased songs. The box features new notes from Pete Townshend, an 80-page book, rare memorabilia and much more. Release date is 18 November 2016. A 3LP vinyl edition including a collection of the mono mixes and the demos plus a 2LP vinyl edition including a collection of the stereo mixes is released on 10 February respectively 17 February 2017. 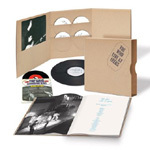 Diese Super Deluxe Edition 5CD Box umfasst 79 Tracks mit Mono- und Stereo-Mixes des ersten Who Albums, viele Bonus Tracks und eine handvoll Demos, unter anderem mit drei unveröffentlichten Songs. Die Box enthält neue Anmerkungen von Pete Townshend, ein 80-seitiges Buch, rare Memorabilien und vieles mehr. Veröffentlichungsdatum ist der 18. November 2016. Eine 3LP Vinyl-Ausgabe mit einer Sammlung der Mono-Mixes und der Demos sowie eine 2LP Vinyl-Ausgabe mit einer Sammlung der Stereo-Mixes erscheint am 10. Februar bzw. 17. Februar 2017. Pete Townshend and his band Deep End accompanied by Pink Floyd's David Gilmour on lead guitar made a live appearance at the MIDEM in Cannes on 29 January 1986. This show was filmed for the famous German TV series Rockpalast and is now available as a DVD-/CD-set. Pete Townshend trat mit seiner Band Deep End und Pink Floyd's David Gilmour an der Leadgitarre am 29. Januar 1986 bei der MIDEM in Cannes auf. Das Live-Konzert wurde im deutschen Fernsehen vom Rockpalast ausgestrahlt und ist nun als DVD-/CD-Set erhältlich. Roger launches his own limited edition Champagne Cuvée Roger Daltrey to toast 50 years of The Who. Anlässlich des 50-jährigen Bestehens von The Who bringt Roger seine eigene limitierte Edition Champagner Cuvée Roger Daltrey auf den Markt. A bespoke parking area exclusively for scooters will be open for this Saturday night's sold out WHO show. The legacy of the mods will be alive and revving when The Who fans take advantage of free parking for their prized scooters in the car park situated in front of The SSE Arena, Wembley. The scooter park will be open from 2.30 pm on Saturday 13 February and will be manned by security until midnight. It is located directly opposite the Sainsbury's Local (which is entered via Engineers Way). No pre-booking is necessary; simply ride up on the day. 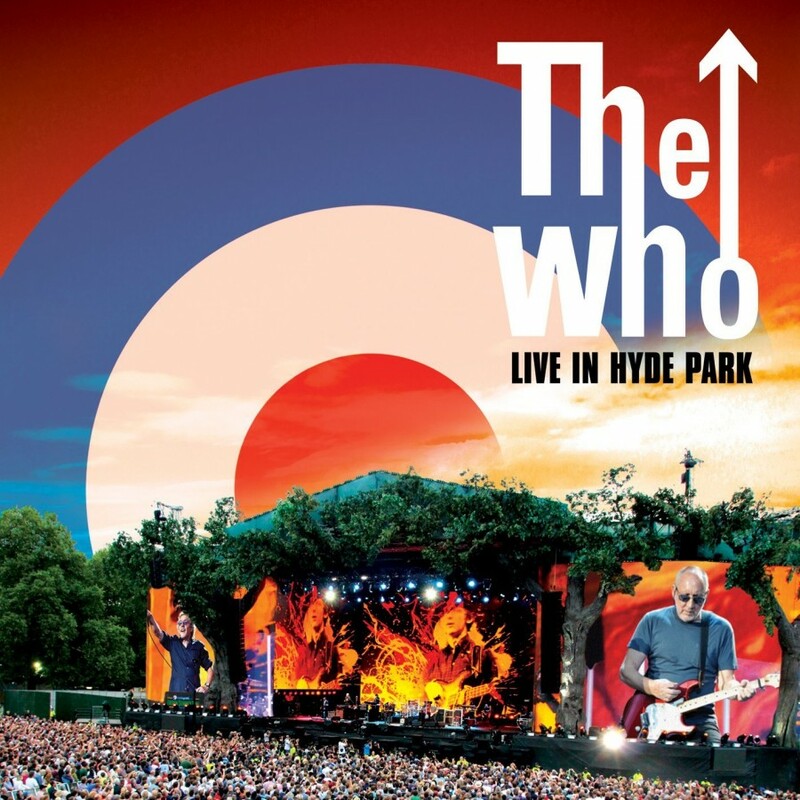 The Who's 2015 show at London's Hyde Park on 26 June was filmed in HD and is issued on 20 November. The deluxe edition features 2 audio CD's, a Blu-Ray and a DVD of the concert housed in a 60-page hardcover book. Further 2CD+DVD, 3LP+DVD, 2CD sets and individual Blu-Ray and DVD editions will be available. Das Who Konzert am 26. Juni 2015 im Londoner Hyde Park wurde in HD gefilmt und erscheint am 20. November. Die Deluxe-Ausgabe besteht aus einem 60-seitigen Hardcover-Buch und enthält 2 Audio-CD's, eine Blu-Ray und eine DVD von der Show. Weitere 2CD+DVD, 3LP+DVD, 2CD und einzelne Blu-Ray und DVD Versionen sind erhältlich. 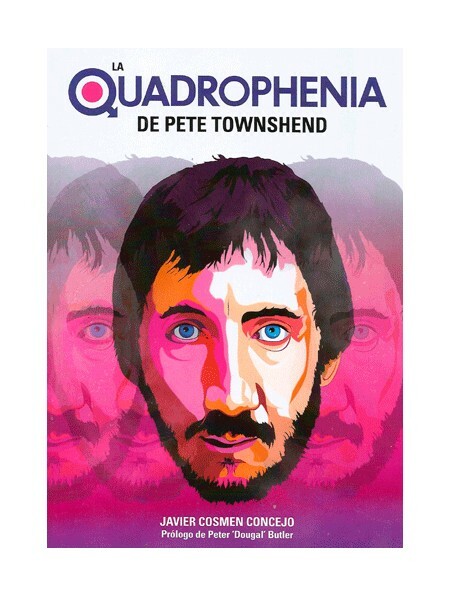 On 9 October a new DVD from Pete Townshend's Classic Quadrophenia performance at London's Royal Albert Hall is released. Also available in BluRay format. Am 9. Oktober ist eine DVD von Pete Townshend's Classic Quadrophenia Live-Aufführung in der Londoner Royal Albert Hall erhältlich, auch als BluRay. 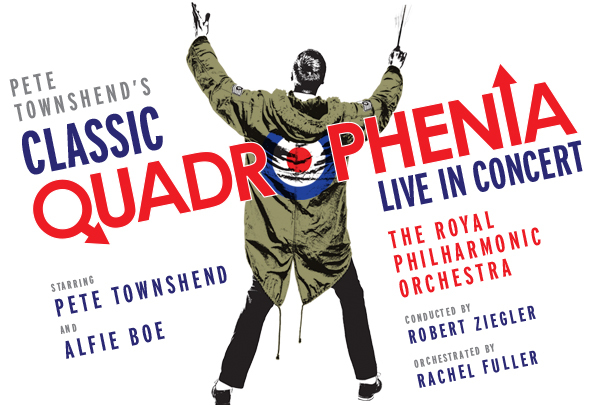 Classic Quadrophenia makes its live debut on Sunday, July 5, when the Royal Philharmonic Orchestra team up with Pete Townshend and very special guests for a show at London’s Royal Albert Hall. In October a few performances take place in Germany and Austria though Pete does not attend there. Das Live Debut von Classic Quadrophenia findet am 5. 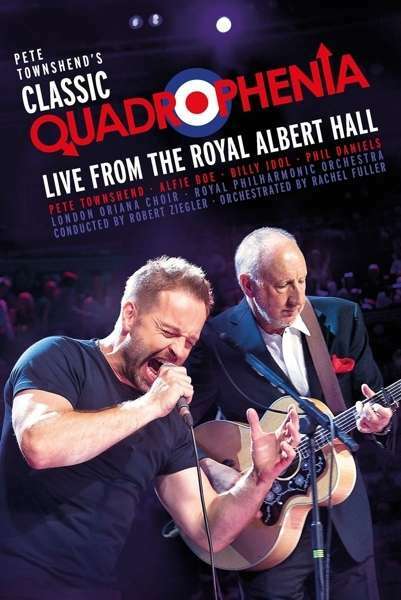 Juli mit dem Royal Philharmonic Orchester, Pete Townshend und vielen Gaststars in der Londoner Royal Albert Hall statt. Im Oktober gibt es einige Aufführungen in Deutschland und Österreich, wo Pete jedoch nicht anwesend ist. 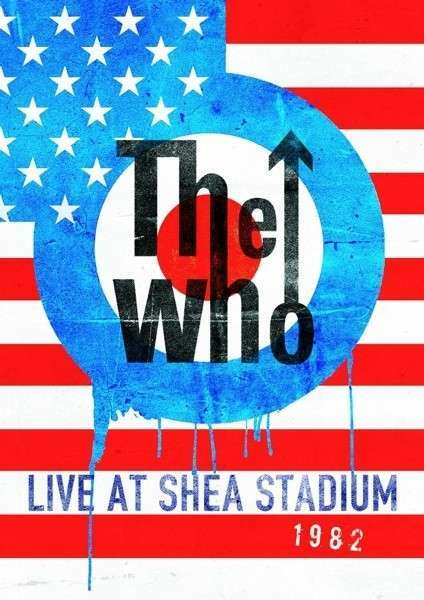 In June a new DVD with The Who's 1982 concert at New York's She Stadium is released. Also available in BluRay format. Im Juni erscheint eine DVD von dem 1982er Who Konzert im New Yorker Shea Stadium. Auch als BluRay erhältlich. 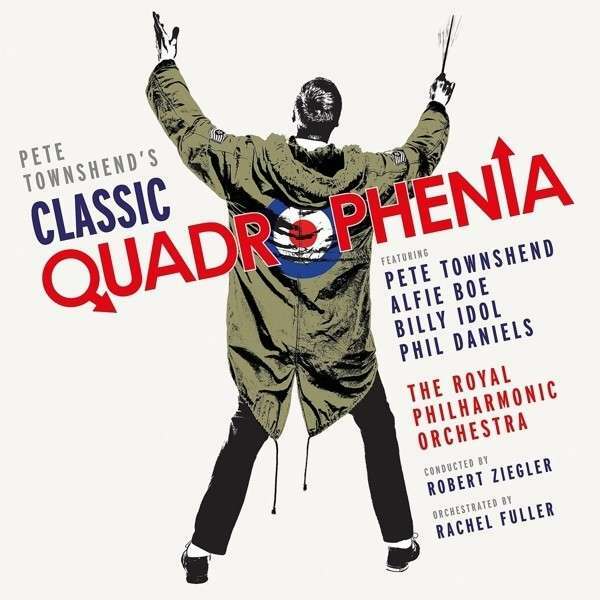 Pete Townshend releases Classic Quadrophenia, an orchestral reworking of The Who’s 1973 album, on June 9. The album was orchestrated by Pete’s partner and singer-songwriter Rachel Fuller and is available in standard (CD / 2LP) and deluxe (2CD) packages. Pete Townshend veröffentlicht am 9. June Classic Quadrophenia, eine Orchester-Version des 1973er Who Albums. Das Album, das von Pete's Partnerin Rachel Fuller orchestralisiert wurde, ist als Standard-Ausgabe auf CD / 2LP und auch in einer 2CD-Deluxe-Version erhältlich. 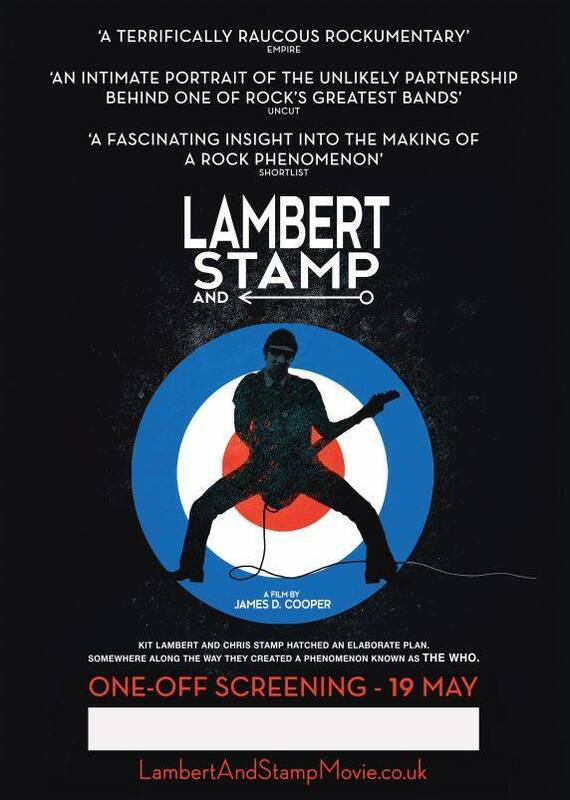 The Lambert and Stamp film will be released in the cinemas from May. There will be a very special screening on Tuesday the 19th May when the film will be shown in several UK cities and only for one time. Der lang angekündigte Film über die beiden Who-Manager Kit Lambert und Chris Stamp ist ab Mai in den Kinos im Vereinigten Königreich, Irland und USA zu sehen. Record Store Day 2015 on April 18 will see a very special blue vinyl of The Who’s latest classic Be Lucky backed with the band’s very first single from 1965, I Can’t Explain remastered in glorious mono. Zum Record Store Day 2015 am 18. April gibt es eine spezielle Ausgabe von Be Lucky auf blauem Vinyl mit I Can't Explain im remasterten Mono auf der B-Seite. 2015 marks the 15th anniversary of the annual Teenage Cancer Trust shows at the London Royal Albert Hall running from 23 to 28 March this year with lots of special artists. 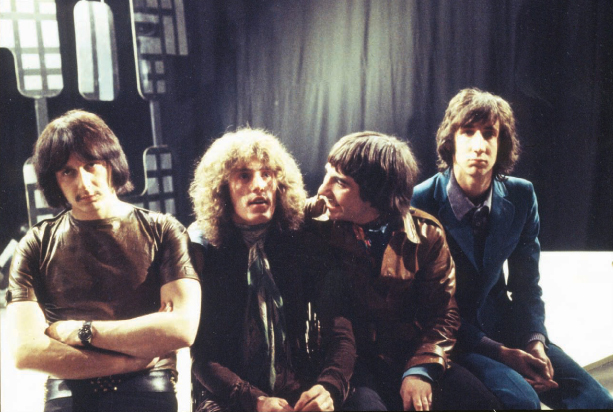 The Who perform on March 26. Vom 23. bis 28. März finden zum 15. Mal die Teenage Cancer Trusts Shows mit vielen Künstlern in der Londoner Royal Albert Hall statt. The Who treten am 26. März auf. 50 years of The Who, the stories behind their songs, Pete Townshend's greatest interview, Keith Moon's tales of hotel room destruction, tributes from Eddie Vedder, Joan Jett, Tom Morello and more, plus the toughest Who quiz ever (98 pages). Auf 98 Seiten zelebriert die amerikanische Sonderausgabe des Rolling Stone 50 Jahre Who Geschichte mit raren Fotos, Fakten und Interviews. 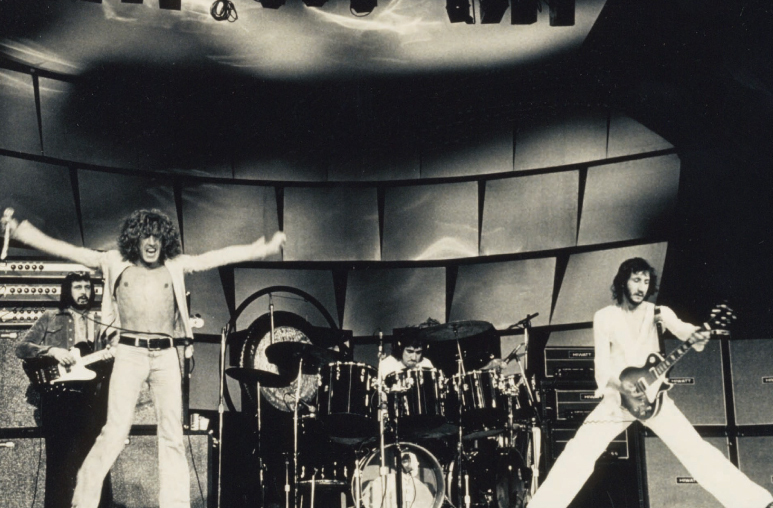 Casey Harison offers a cultural and social history of The Who during their first decade. He describes the key role played by The Who in the formation of the Atlantic Generation of rock 'n' roll fans and he looks at the musical and social cross-Atlantic feedback that characterized the Who's reception and impact. Casey Harison beschreibt die kulturelle und soziale Schlüsselrolle von The Who in den ersten 10 Jahren ihrer Bandgeschichte in Bezug auf Rock 'n' Roll Fans im Nordatlantikraum und anhand von Fan-Feedbacks, welchen Eindruck The Who damals bei ihnen gemacht hat (in englischer Sprache). Between 1964 and 1969 The Who released some of the most dramatic and confrontational music of the decade. Mark Blade presents a unique perspective on The Who from their breakthrough as mod figureheads to the rise and fall of psychedelia in the sixties. Zwischen 1964 und 1969 haben The Who einige der tiefgreifendsten Songs des musikalischen Jahrzehnts herausgebracht. Mark Blade präsentiert aus seiner eigenen Perspektive The Who von ihrem Durchbruch als Mod-Ikonen bis zum Aufstieg und Fall der psychedelischen Musik in den Sechzigern (in englischer Sprache). 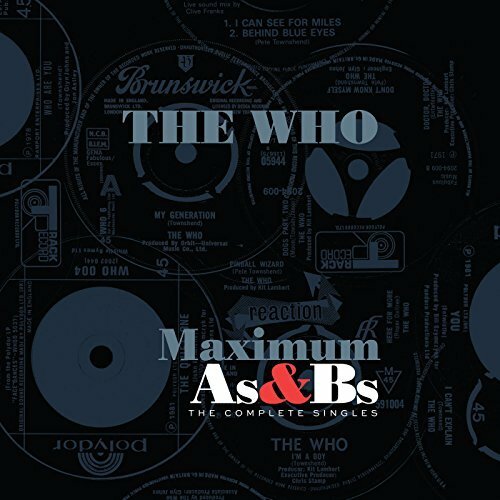 The Who's first new song since 2006 which was already included in the Hits 50 compilation is now released on 13 December as vinyl single as part of Universal's 12 Days Of Christmas special promotion. The onesided disc is limited to 1800 copies and only available at selected UK record stores. Den ersten neuen Who Song seit 2006, der bereits auf der Hits 50 Zusammenstellung enthalten ist, hat Universal nun am 13. Dezember als Vinyl Single als Teil einer speziellen Weihnachtsaktion herausgebracht. Die einseitig bespielte Scheibe ist auf 1800 Stück limitiert und nur bei ausgewählten Händlern in England erhältlich. Keith Moon's 1964 Ludwig Super Classic is part of a memorabilia sale to be held at Bonhams Knightsbridge on December 10, 2014. Moon first used the kit in 1964 while in the High Numbers. 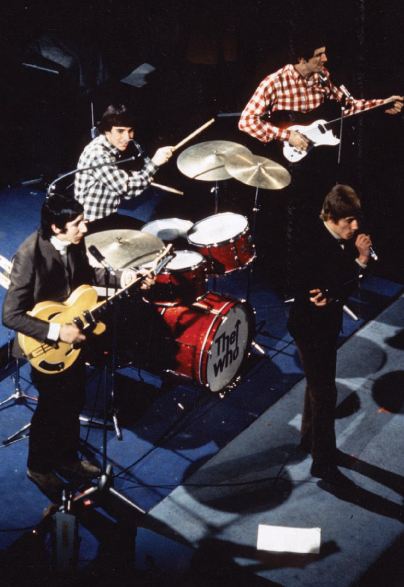 The last known date of use was May 23, 1965, for The Who's recorded appearance on ABC TV's show, Thank Your Lucky Stars. The kit carries an estimated price of £15,000-20,000. A deluxe edition 2CD of Wilko Johnson's and Roger Daltrey's joint album is released in November 2014. 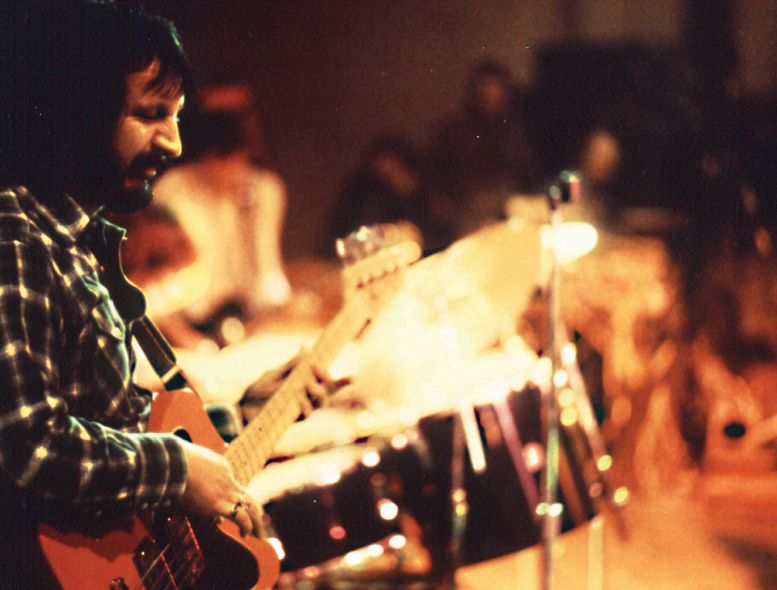 The double CD features 18 additional songs of the recording session. Eine 2CD Deluxe Ausgabe von Wilko Johnson's und Roger Daltrey's Gemeinschaftsalbum ist ab November 2014 in den Läden erhältlich. Die Doppel-CD enthält 18 zusätzliche Songs, die aus den Recording Sessions stammen. In November 2014 a new compilation CD is released with a collection of great Who hits including the very new unreleased song Be Lucky. There are two versions available, a one disc version with 21 songs and a two disc version with 42 tracks. Im November 2014 ist eine eine neue CD erhältlich, die neben bekannten großen Who Hits auch einen brandneuen, unveröffentlichten Song mit dem Titel Be Lucky enthält. Von Hits 50 gibt es eine 1-CD-Version mit 21 Songs und eine 2-CD-Version mit 42 Tracks. Roger Daltrey, a repeat headliner and longtime supporter of Rock ‘n’ Roll Fantasy Camp attends at the newly camp. The event takes place on 16-19 October 2014 at Foxwoods Resort Casino. On 28 July 2014 Roger performs a concert in Philadelphia's Kimmel Center to benefit a children's hospital for Teen Cancer America. Die Titelstory der aktuellen Juli/August-Ausgabe des Eclipsed Rock Magazins ist einer großen Quadrophenia-Story gewidmet, die nicht nur die Entstehung des Original-Albums in 1973 beleuchtet, sondern auch mit kurzen Artikeln zu den Mods in Brighton und zum Quadrophenia-Film sowie einem Interview mit Eddie Vedder angereichert wird. 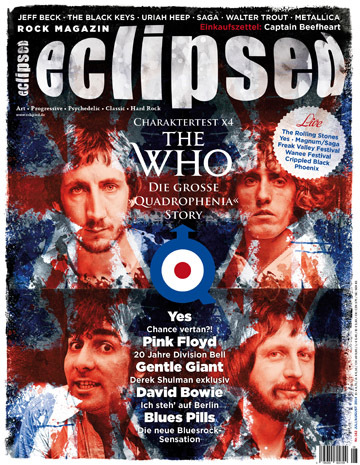 The actual July/August issue of German rock magazine Eclipsed contains a huge Quadrophenia story about the original album from 1973 including short essays about the movie, the mods in Brighton and an interview with Eddie Vedder. 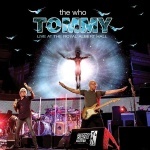 Das Theater in Pforzheim bringt The Who's Tommy auf die Bühne. Premiere des Musicals ist am 6. Juni. Weitere Termine stehen bereits bis zum Jahresende fest. In the second half of 2014 the Theater Pforzheim, Germany, presents Tommy the musical. Premiere is on 6 June. The Who celebrate the 40th anniversary of Quadrophenia with a bunch of audio and video releases. 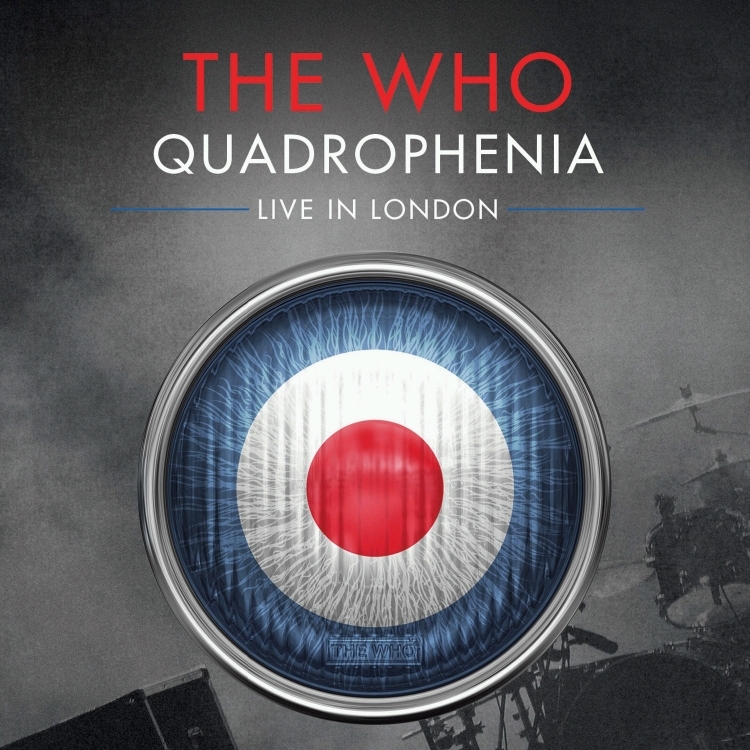 Filmed on July 8, 2013, Quadrophenia Live In London features The Who in peak form, performing Quadrophenia from front to back, in its entirety, plus a special set of some of their all-time greatest hits. It will be available in June 2014 in various configurations including an expanded Deluxe Metal Box. Taken from the album of the same name, Going Back Home b/w Ice On The Motorway is released as vinyl single on 19 May 2014. 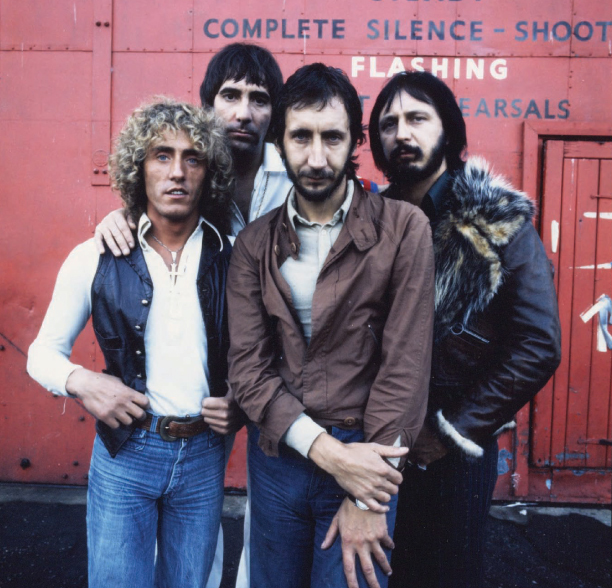 Whether they were Mods or punk pioneers, rock Wagners, or a gang of guitar-smashing thugs, the Who are a band beyond categorisation or comparison, a band that constantly poses new questions - and The Who FAQ digs. Ob sie Mods waren oder die Pioniere des Punk Rock, ob sie Rock-Opern schrieben oder Gitarren zertrümmerten, die Who sind eine unvergleichliche Band, die in keine Schublade passt und über die es viele Fragen gibt - das Buch The Who FAQ hat die Antworten darauf (in englischer Sprache). 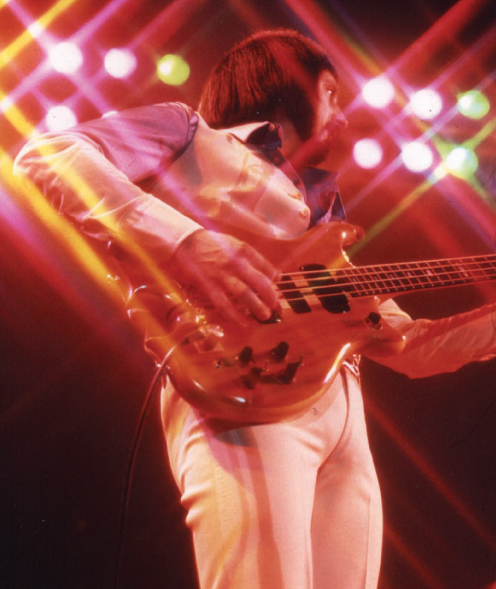 The Who’s Sensation: The Story of Tommy is available on DVD and Blu Ray on March 11th. You can pre-order your copy now along with exclusive t-shirt, and poster that will have your name printed on it. Wilko Johnson and Roger Daltrey release a joint album in March. The album features 11 tracks, 10 of which are Johnson originals from both his Dr. Feelgood days and solo years. Johnson and Daltrey will perform tracks from the album at a one off show at London's O2 Shepherds Bush Empire on February 25. Wilko Johnson und Roger Daltrey bringen im März ein Gemeinschaftsalbum heraus. 10 der 11 Songs stammen aus Johnson's Zeit bei Dr. Feelgood und aus seinen Solojahren. Am 25. Februar präsentieren Johnsons und Daltrey im Londoner O2 Shepherds Bush Empire Stücke aus dem Album live. 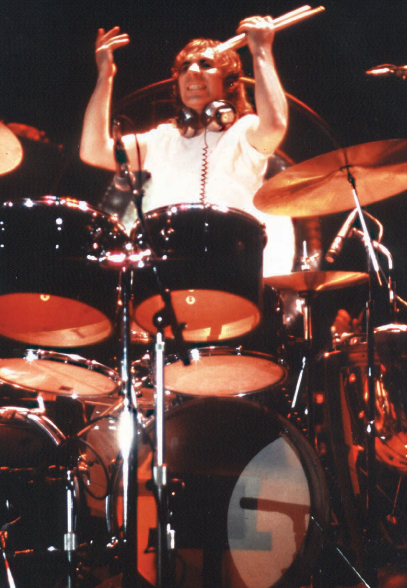 Doug Sandom joined The Who - then known as The Detours - as their drummer in 1962. It was a time when fires were being lit under the music scene worldwide, everything had to change and The Detours had a long way to go to become revolutionary leaders in their field. Doug has finally decided to write his memoirs. It is a punchy tale of gritty determination and ever-burning passion for music. 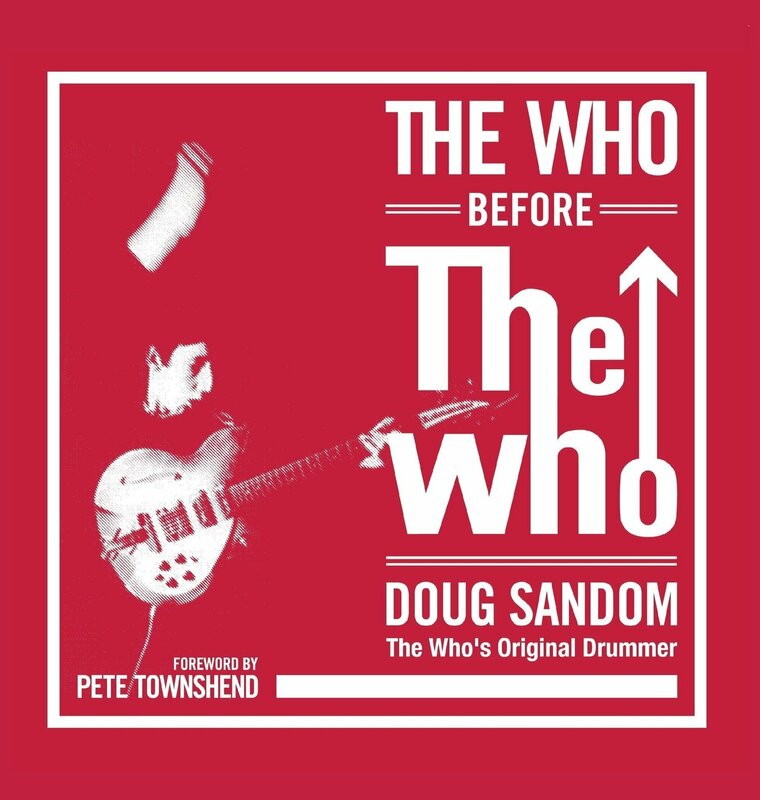 As Pete Townshend writes in his moving foreword "Doug Sandom's work with our band gave me the confidence to drive the band as a writer and creative thinker ..."
Doug Sandom kam 1962 als Schlagzeuger zu den Who - damals noch The Detours. Nun hat er sich entschieden, seine Memoiren zu schreiben. Ca. 150 Seiten, auf englisch, mit einem Vorwort von Pete Townshend. In various Uncut blogs and interviews Pete and Roger talk about their plans for their 50th anniversary in 2014. 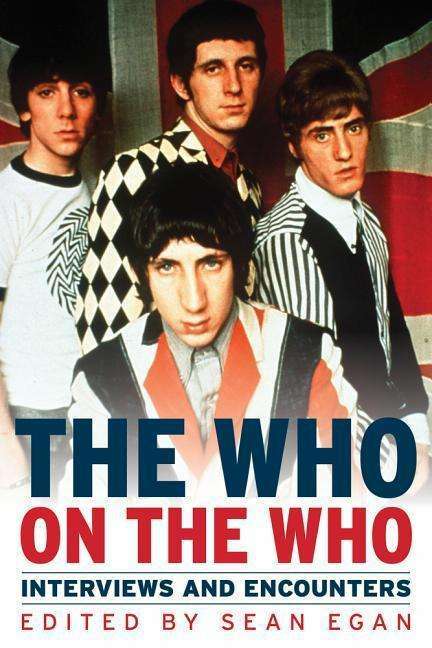 With a view to The Who's 50th anniversary in 2014 this book strolls through the story of the band on 64 pages along with lots of pictures. Slip case includes six 8x10 prints. 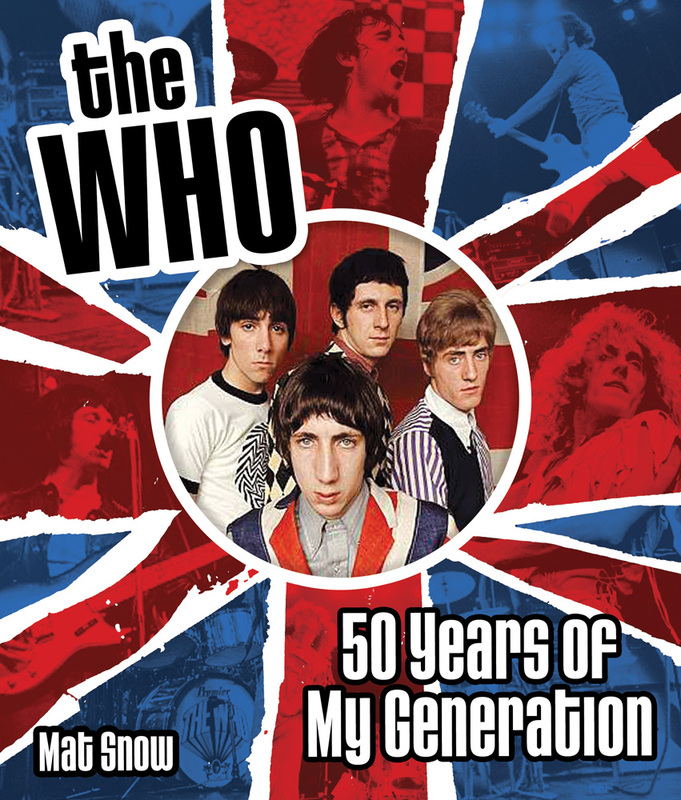 Im Hinblick auf das 50-jährige Jubiläum von The Who in 2014 unternimmt das Buch auf 64 Seiten mit vielen Bildern einen Streifzug durch die langjährige Bandgeschichte. Die Mappe enthält zusätzlich sechs großformatige Fotodrucke. 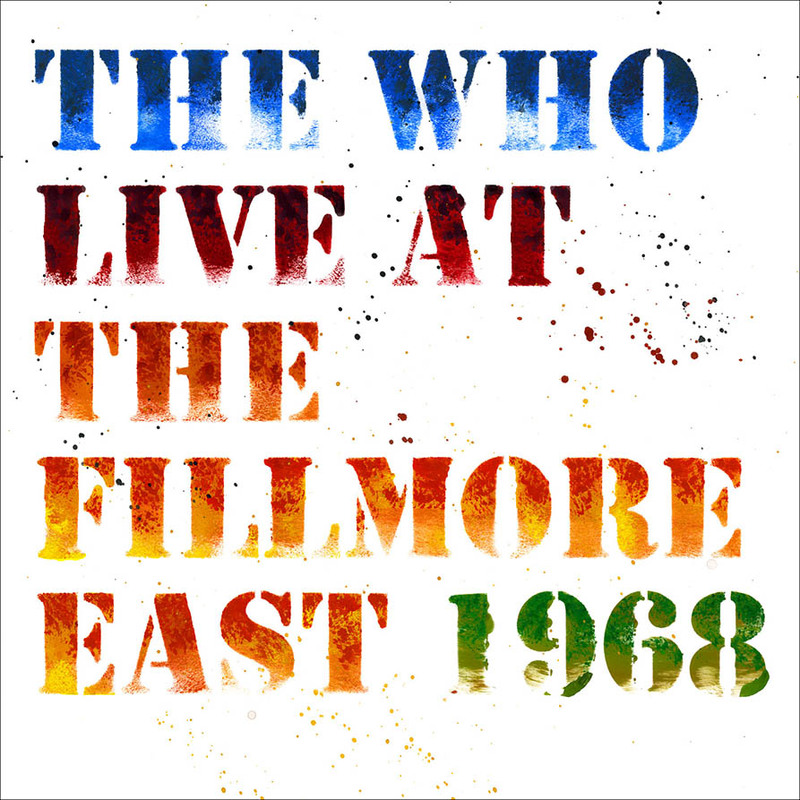 Out on 11th November 2013, the set features the seminal 1969 rock opera in full 5.1 surround sound, plus a host of bonus and demo recordings all taken from The Who's and Pete Townshend's personal archives. It also includes a complete disc of unheard concert recordings, most of which were recorded at the Capital Theatre, Ottawa, in 1969, with a few from other shows on that Tommy tour. These tapes were, legendarily, all supposed to have been destroyed, so quite a find! Memorabilia include handwritten lyrics, notes, posters and unseen photos. Besides the box some CD and vinyl issues are released with parts of the material. Roger Daltrey performs on Saturday, 10 August 2013, as charity concert to benefit Teen Cancer America and part of the Toyota Summer Concert Series at the Pacific Amphitheatre at the 2013 OC Fair in Costa Mesa, California USA. As always, concert and action sports tickets include Fair admission. 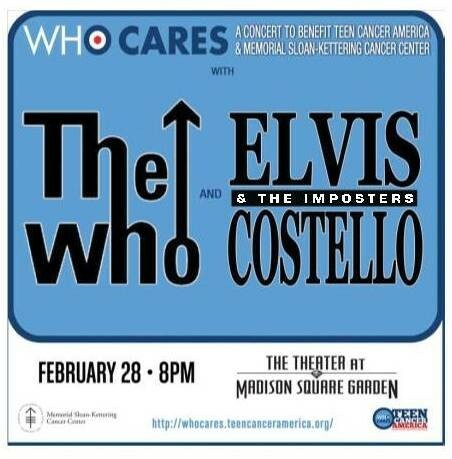 The Who and Elvis Costello & The Imposters perform an intimate concert on 28. February 2013 at New York City’s Theater at Madison Square Garden to benefit Teen Cancer America and Memorial Sloan-Kettering Cancer Center. The Who und Elvis Costello & The Imposers spielen am 28. Februar 2013 im New Yorker Madison Square Garden Theater ein Benefiz-Konzert zugunsten des Memorial Sloan-Kettering Krebs-Zentrums für krebskranke Teenager in Amerika. Roger Daltrey, a repeat headliner and longtime supporter of Rock ‘n’ Roll Fantasy Camp attends at the newly camp. The event takes place on 23-27 January 2013 at the MGM Grand in Las Vegas. The Who has teamed up with the Robert F. Kennedy Center for Justice and Human Rights and auctioning the chance to meet Pete and Roger with two VIP tickets to their Hard Rock Hotel and Casino Show in Las Vegas on February 8, 2013. Bidding is open now through December 11th. A limited edition vinyl box set of all eleven Who studio albums is released in November. All of the albums have been re-mastered by long time Who associate Jon Astley in 24-96 format on virgin heavyweight vinyl. The box itself is a hard, full-colour presentation with matt lamination and spot-gloss varnish. 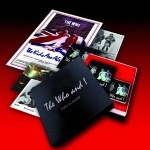 Already issued in 2010 within the Live At Leeds 40th anniversary special edition box the Who's concert in Hull is now released separately on November 6, 2012. The Hull gig was recorded on 16th February 1970 just two days after The Who's memorable performance at the Leeds University. Pete's long awaited memoir is published in October. 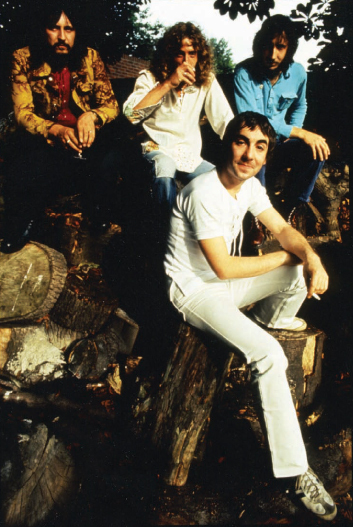 Who I Am spans the life and times of Pete as guitarist,	songwriter, singer, and founding member of The Who. Im Oktober sind nun endlich Pete's Memoiren erscheinen, an denen er in den letzten Jahren mit Akribie gearbeitet hat. Die englischsprachige Autobiografie umfasst sein Leben als Gitarrist, Songschreiber, Sänger und Gründungsmitglied von The Who. Ron Deutsch discusses the story of the pie and mash shop used as a location in the Quadrophenia movie and posted a recipe for beef pie & mash. Ab September (2012) wird am Theater Bielefeld Tommy das Musical aufgeführt. In September (2012) the Theater Bielefeld starts presenting Tommy the musical. This various artists double CD features The Who's medley from the closing ceremony of the Olympic Games in London 2012. End of October a DVD with Olympic highlights will be released. It is not sure if the entire Who medley will be included on this DVD. Diese Doppel-CD mit verschiedenen Interpreten enthält das Who-Medley von der Abschlußfeier der Olympischen Spiele 2012 in London. Ende Oktober soll auch eine DVD mit den Olympia-Höhepunkten erscheinen. Ob das komplette Who-Medley darauf enthalten sein wird, ist noch ungewiss. 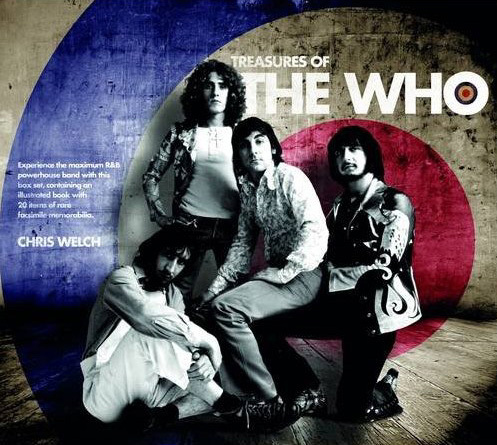 Treasures of The Who tells the whole fascinating story that has spanned six decades and is still going! Insightful text from a journalist who followed the band from the very beginning, photographs from the best contemporary photographers are complemented by items of superb, rare memorabilia, much of it from the early days of the band's existence. Author Chris Welch has released, for the first time, live footage of the band in their heyday that has never been published before. Autor Chris Welch, der bereits einige Titel in der Who-Bibliothek veröffentlicht hat, legt hier sein neuestes Werk über The Who vor. Das englischsprachige Buch enthält unter anderem viele Fotos aus den Anfangstagen der Band. A new compilation CD is released on May 28th. It includes 19 already published before songs and beyond the common Who hits it also lists a few unusual compilation tracks like Armenia City In The Sky, Young Man Blues and Another Tricky Day. Eine neue CD-Zusammenstellung ist ab 28. Mai erhältlich. Die CD mit 19 bereits veröffentlichten Songs enthält neben bekannten Who-Hits auch einige eher ungewöhnliche Titel wie Armenia City In The Sky, Young Man Blues und Another Tricky Day. Under the banner of the edition of Quadrophenia	Director's Cut a few items are released. A real gem is the special deluxe edition box set which contains 4 CD's with a remastered version of the original album and demos, a 5.1 audio DVD, a 7" vinyl, a 100 page hardcover book and a couple of repro memorabilia. The 2-CD deluxe edition contains the remastered album version and lesser demo tracks, a 2-LP vinyl version includes only a remastered reissue of the original album without demo tracks, and finally a limited 10" EP with six demo tracks which was exclusively issued in USA at Black Friday Record Store Day and of which a second 10" EP followed on April 21. In UK is a special double 10" EP released which includes the demos of the two Record Store Day EP's. Aus der Quadrophenia Director's Cut Edition sind verschiedene Tonträger erschienen. Das Prunkstück ist die Super Deluxe Edition Box, die 4 CD's mit einer Remaster-Version des Original-Albums sowie Demos, eine 5.1 Audio-DVD, eine Vinyl-Single, ein 100-seiten starkes Buch und einige Repro-Memorabilia beinhaltet. Eine abgespeckte 2-CD Ausgabe enthält die Remaster-Version und weniger Demos, eine 2-LP Vinylversion ist lediglich eine remasterte Reissue des Original-Albums, und schließlich ist in den USA eine limitierte 10" EP herausgekommen, die nur 6 Demos enthält und von der am 21. April noch eine weitere Ausgabe erschienen ist. Um das Ganze noch zu abzurunden ist in England eine Spezial-Doppel-EP-Ausgabe veröffentlicht worden, die die Demos der beiden Record Store Day EP's enthält. Mit einer Neuinszenierung von Tommy tourt das Londoner Musical Ensemble im Frühjahr 2012 durch Deutschland, Österreich und Belgien und gibt dabei vom 18.-29. April 2012 auch ein mehrtägiges Gastspiel im Deutschen Theater in München. 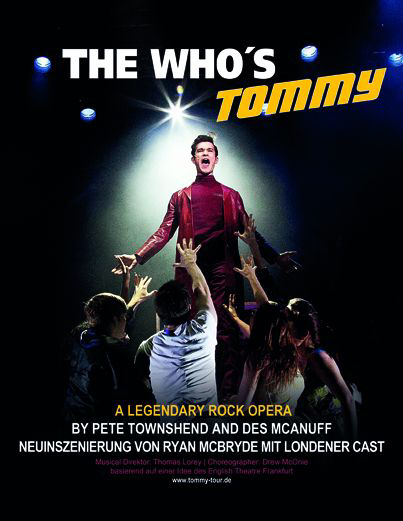 The London cast tours with a new stage production of Tommy through Germany, Austria and Belgium including a several days guest performance at the Deutsches Theater in Munich in spring 2012. Roger and special guests kick off this year's Teenage Cancer Trust shows which take place from 28 March to 3 April 2012 at London's Royal Albert Hall. Roger und einige andere Stars eröffnen die diesjährigen Teenage Cancert Trust Shows, die vom 28. März bis 3. April 2012 in der Londoner Royal Albert Hall stattfinden. Christoph Geisselhart geht mit "Maximum Rock" auf Tour: Die inszenierte Autorenlesung mit Musik und Bildern. Warm-up Show am 9. März 2012, 20 Uhr in Stuttgart. 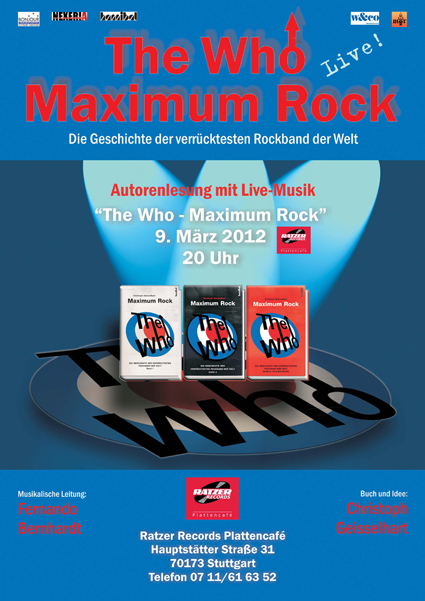 Author Christoph Geisselhart of the German Who biography "Maximum Rock" goes live with reading and music. Akkord-Songbuch: Arrangement für Gitarre inklusive Akkordgitter und vollständige Songtexte. To celebrate the release of The Who’s Quadrophenia - The Director’s Cut, Liam Gallagher’s flagship store, Pretty Green in London's Carnaby Street, is holding an exhibition telling the story behind the concept of Quadrophenia alongside with the display of some memorabilia items. Entrance is free and the exhibition runs until 31 January 2012. Wer sich demnächst in London aufhält, sollte einen Abstecher zu Liam Gallagher's Pretty Green Shop in der Carnaby Street machen. Dort findet bis zum 31. Januar 2012 eine Ausstellung rund um die Story von Quadrophenia statt. Der Eintritt ist frei. In autumn 2011 Roger and his solo band did a fantastic European and North American tour performing Tommy plus a variety of Who classics and more. Roger Daltrey Band: Simon Townshend (guitar), Frank Simes (guitar), Jon Button (bass), Scott Devours (drums), Loren Gold (keyboards). Among other rock stars Pete plays at this years Rock Gala to raise funds for the Prince's Trust. The event takes place on November 23, 2011 at London's Royal Albert Hall. Neben einigen anderen Rockstars tritt Pete bei der diesjährigen Rock Gala zugunsten des Prince's Trust auf. Das Konzert findet am 23. November 2011 in der Londoner Royal Albert Hall statt. The Who are set to re-affirm their global legendary status with the imminent release of Quadrophenia The Director's Cut. To commemorate the album's release and pay homage to 1960s Mod Culture, The Who are inviting filmmakers and animators to unleash their creativity and submit a music video that does for the track what the film did for the album. The video should reflect the 1960s Mod Culture and show inspiration from the musical and visionary journey portrayed in that era. The winning video will be produced as the official video for 5.15. 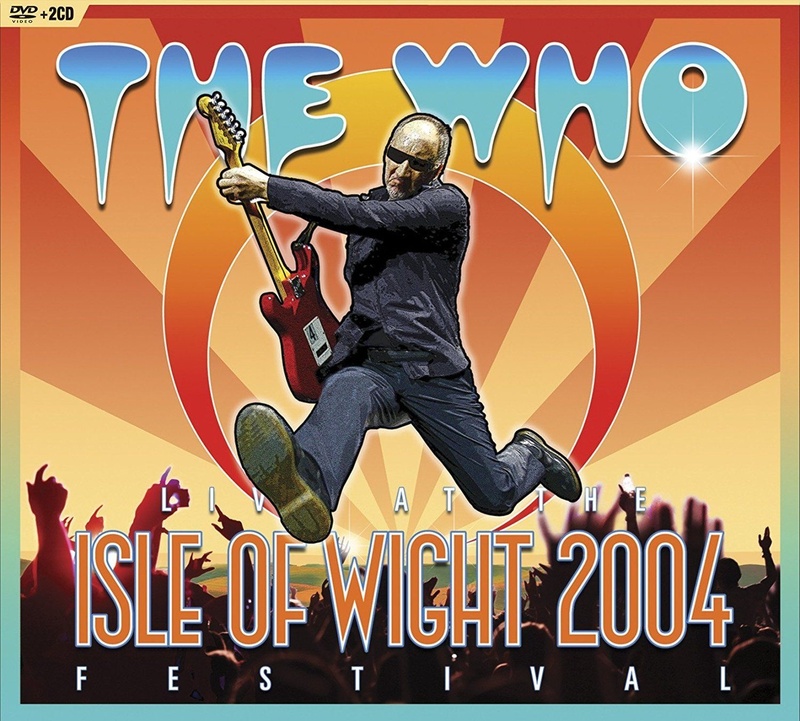 A vinyl version of the Who's 1970 Isle Of Wight live performance is reissued in September 2011, also a special coloured vinyl edition with a red, blue and white disc. The album was originally released in 1996 and already reissued on CD in 2009. Ein Reissue der Vinyl-Version des 1970er Isle Of Wight Konzerts ist im September 2011 herausgekommen, auch eine farbige Vinyl Ausgabe mit einer roten, blauen und weissen Platte. Das Original Album erschien 1996 und wurde bereits 2009 auf CD wiederveröffentlicht. 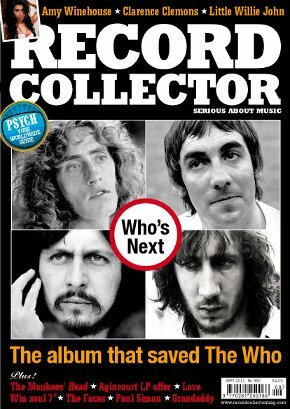 Record Collector magazine issue 392 (Sep.2011) includes a 16 page story about Who's Next. Dave Lewis unfolds the story of how The Who turned confusion into cohesion - creating their greatest studio album in the process. Die September-Ausgabe des englischen Record Collector enthält einen 16-seitigen Bericht rund um die Entstehung eines der grössten Alben der Rockgeschichte: Who's Next. 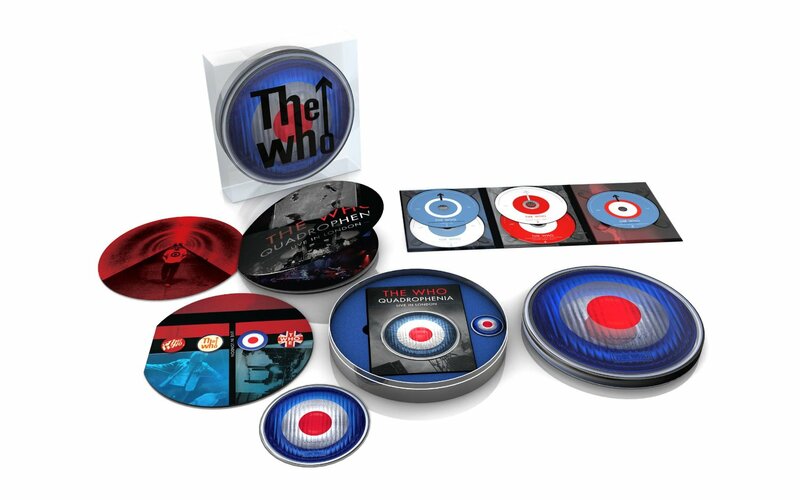 Universal Music have issued The Who in their new Icons album series. The series includes both single and double disc best-of collections from a range of rock and pop's biggest names. Release dates of the Who single and double discs are April 5th. Universal Music haben The Who in ihrer Icon Album Serie veröffentlicht. Die Serie beinhaltet sowohl Einzel- als auch Doppel-CD's mit jeweiligen Best-Of-Zusammenstellungen. Die Who Einzel- und Doppel-CD's sind seit dem 5. April auf dem amerikanischen Markt und ab 12. April bei uns erhältlich. Teenage Cancer Trust has just announced the line-up to its 11th annual week of music and comedy gigs at the Royal Albert Hall in London. The highlight for Who fans will be a special performance on Thursday 24 March by Roger of	The Who's 1969 rock opera TOMMY. Roger will also perform early hits including material from LIVE AT LEEDS. Das Highlight für Who Fans bei den diesjährigen TCT Concerts wird eine spezielle Aufführung von Roger mit TOMMY am Donnerstag 24. März sein. Roger will ausserdem frühe Hits und Material aus LIVE AT LEEDS präsentieren. Roger is doing a warm up show for his sold out performance of The Who’s 'Tommy' at The Royal Albert Hall in London a few days later. 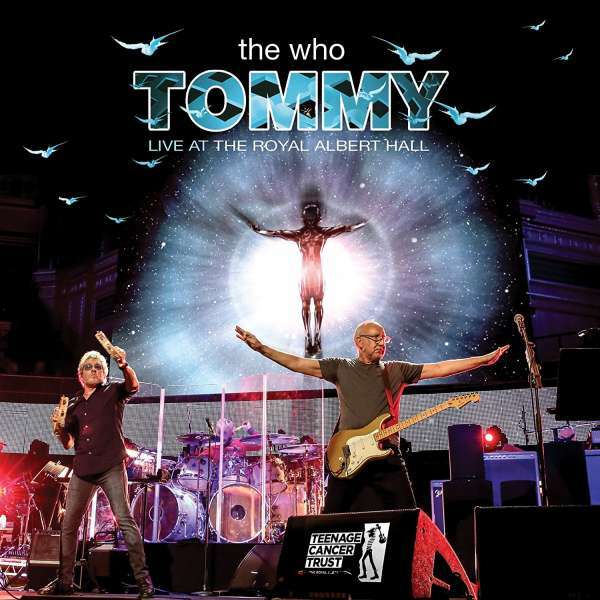 Roger comments: "I’m not sure if we’ll be ready to play the whole of Tommy by then but the show will feature a lot of Who songs, some of which The Who rarely if ever perform, plus some of my solo hits and a few surprises. I’m looking forward to getting some sun and sea air in Bournemouth and playing the old Opera House (now the O2 Academy)". Als Einstimmung auf das ausverkaufte Londoner TCT Ereignis einige Tage später wird Roger in der O2 Academy in Bournemouth ein Konzert geben. Im Repertoire hat er jede Menge Who-Songs, ein paar Solo-Hits und "einige Überraschungen". 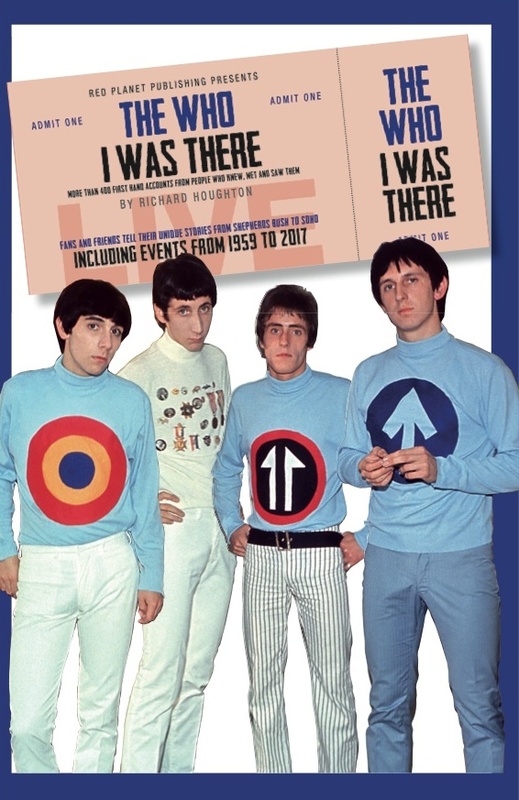 Acclaimed author and music historian Richie Unterberger has written a book about the Who's period from Lifehouse to Quadrophenia which is now available. Musik Autor und Historiker Richie Unterberger hat ein englischsprachiges Buch über die Who-Periode zwischen Lifehouse und Quadrophenia geschrieben, welches nun erhältlich ist. The latest Ultimate Music Guide from the Uncut team turns the spotlight on one of the most exciting, bright, controversial – and loud! – rock bands that Britain has ever produced. Over 148 pages, Uncut salutes the majesty and audacity of The Who. Die neueste Ausgabe des Ultimate Music Guide vom Uncut Team widmet sich auf über 148 Seiten der aufregendsten, kontroversesten - und lautesten! - Rockband, die England je hervorgebracht hat: The Who! Eine der bekanntesten Nasen der Rockgeschichte schaut Euch vom neuen guitar-Titel entgegen: Pete Townshend und vor allem seine Band The Who brachen früher bereits alle Härte- und Lautstärkerekorde – und sind auch heute noch trotz Rentenalter auf Tour. In die Geschichte sind in den vergangenen Jahrzehnten nicht nur unvergessliche Songs wie "My Generation" und "Won’t Get Fooled Again" eingegangen, sondern auch zahlreiche Mythen und Legenden. Im Legends-Special erfahrt Ihr alles über den ohrenbetäubenden Kult seit den Sechzigern und bekommt eine Auswahl der besten Riffs und Licks als Noten/TABs im Heft und Playalong auf der guitar-CD zur Hand. 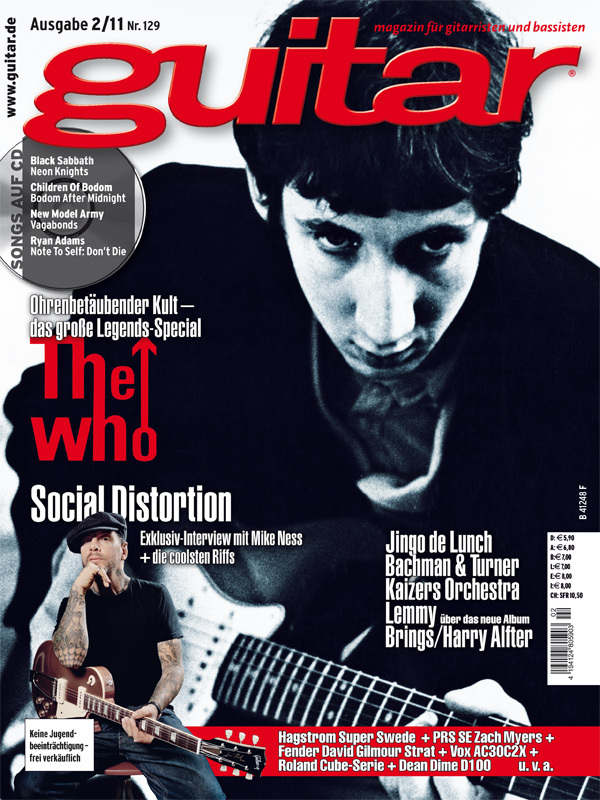 German guitar magazine issue 02/2011 contains an 11 page The Who cover story. Longtime Who fan, author and photographer Matt Kent has published a new and recommendable Who book. Der langjährige Who-Fan, Autor und Fotograf Matt Kent hat ein neues und empfehlenswertes Who-Buch herausgegeben. 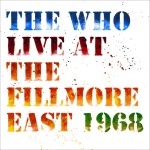 This newly released double CD contains 22 great live recordings. Most of them were never widely available or unreleased and some of them are newly mixed by the band and their production team. Released date in USA is March 23rd, 2010. Except 6 tracks these live recordings are issued on the European 2CD Greatest Hits & More. Dieses Doppel-CD-Set beinhaltet 22 großartige Live-Aufnahmen und ist in den USA am 23.März 2010 herausgekommen. Die meisten Aufnahmen waren zuvor unveröffentlicht und einige sind neu abgemischt. Bis auf sechs Titel sind diese Liveaufnahmen bereits auf der in Europa erhältlichen 2CD "Greatest Hits & More" erschienen. 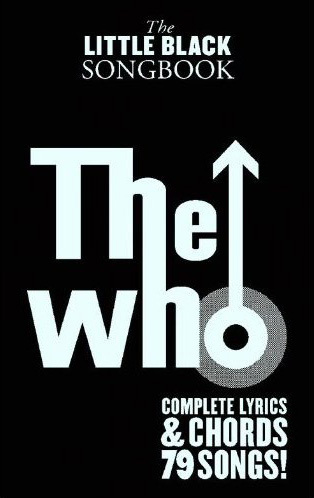 The largest single-disc "best of" collection from The Who in more than ten years, it is the first to span the group’s entire recording career to date, from 1964 to 2006. The 19-selection Greatest Hits brings together some of rock’s most important, influential and incandescent touchstones, along with an essay by renowned music critic Dave Marsh. Release date in North America is December 21st, 2009. A double CD version including a bonus disc with a collection of live tracks is released in Europe on February 8th, 2010. Hard Rock International’s Signature Series Edition XXVII T-shirt was designed by Pete Townsend and Roger Daltrey. Proceeds from the new Signature Series T-shirt will benefit The Who’s charity of choice, City of Hope, an innovative biomedical research, treatment and educational institution dedicated to the prevention and cure of cancer and other life-threatening illnesses. The shirts are available online and at all Hard Rock locations. The Who finden Einzug in Hard Rock International's Signature T-Shirt Serie. 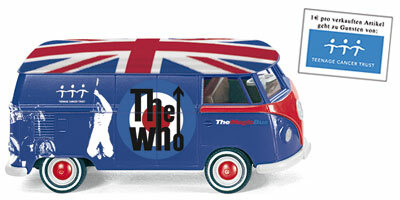 Das Design der Edition XXVII wurde von Pete Townshend und Roger Daltrey entworfen. Die Erlöse aus dem T-Shirt-Verkauf lassen The Who der City Of Hope zukommen, einer Organisation, die sich unter anderem dem Kampf gegen Krebskrankheiten verschrieben hat. Das T-Shirt ist in allen Hard Rock Lokalitäten und online erhältlich. Proud Galleries are hosting an exclusive exhibition of Colin Jones’s photographs of the music and style icons that are The Who. It will run from 24th September until 15th November 2009 in our Central gallery in Charing Cross, London. The Who: In The Beginning will present an intimate photographic portrait of Swinging London’s most explosive rock band. Internationally renowned photographer Colin Jones pays homage to the pioneering troupe with revealing precision. As well as capturing their vibrant on-stage presence, this series of intimate and personal photographs presents the band from the other side. We see Daltrey as he dries his hair, Entwistle practising the guitar whilst his mother darns his socks, and the whole band shopping for new suits off the King’s Road. Proud Galleries präsentiert exklusiv eine Ausstellung des international bekannten Fotografen Colin Jones mit frühen Aufnahmen von The Who während der Swinging Sixties. Die Ausstellung geht vom 24. September bis 15. November 2009 und ist in der Londoner Central Gallery am Charing Cross zu sehen. In August Wienerworld are releasing a massive title called "Woodstock Diary". An enthralling "fly on the wall" documentary about the creation of Woodstock, on its 40th anniversary, August 15th 1969 and of the actual three day event itself when nearly 500,000 people were raptured by the pop greats. It contains live footage of all the bands and performers who appeared including The Who, Richie Havens, Santana, Janis Joplin, Arlo Guthrie, Sha Na Na, Incredible String Band, Jefferson Airplane, Sly and the Family Stone, Johnny Winter, Crosby Stills & Nash, Joe Cocker, Jimi Hendrix …. the list just goes on! This is a 180 minute blast from the past – a must have DVD title! Im August bringt Wienerworld diese neue DVD heraus, eine 3-stündige Collage aus Musik, Interviews und Eindrücken des legendären Woodstock-Festivals, das im August 1969 vor nahezu 500000 Zuschauern statt fand. Neben solchen Musikgrößen wie Santana, Janis Joplin, Jefferson Airplane, Johnny Winter, Crosby Stills & Nash, Joe Cocker und vielen anderen sind The Who mit "My Generation" vertreten. Aus musikhistorischer Sicht hat die DVD einen hohen Dokumentationswert, dennoch kommt das Flair dieses Festivals nicht ganz so hautnah herüber. Der Schwerpunkt liegt eindeutig auf der Musik und davon gibt es hier reichlich. The outrageous rockopera Lisztomania casts Roger Daltrey as the world's first music superstar, Franz Liszt. Loosely based on the life of the composer, the film takes a fantastical voyage through rock'n'roll excess and adventure, peppered with cameos from such pop icons as Ringo Starr (as the Pope) and Rick Wakeman (as Thor). After the triumphant Tommy (made in the same year 1975) the dynamic pairing of The Who frontman and visionary filmmaker Ken Russell reunited again for this opus which is now available on DVD. Release date is May 4th, 2009. 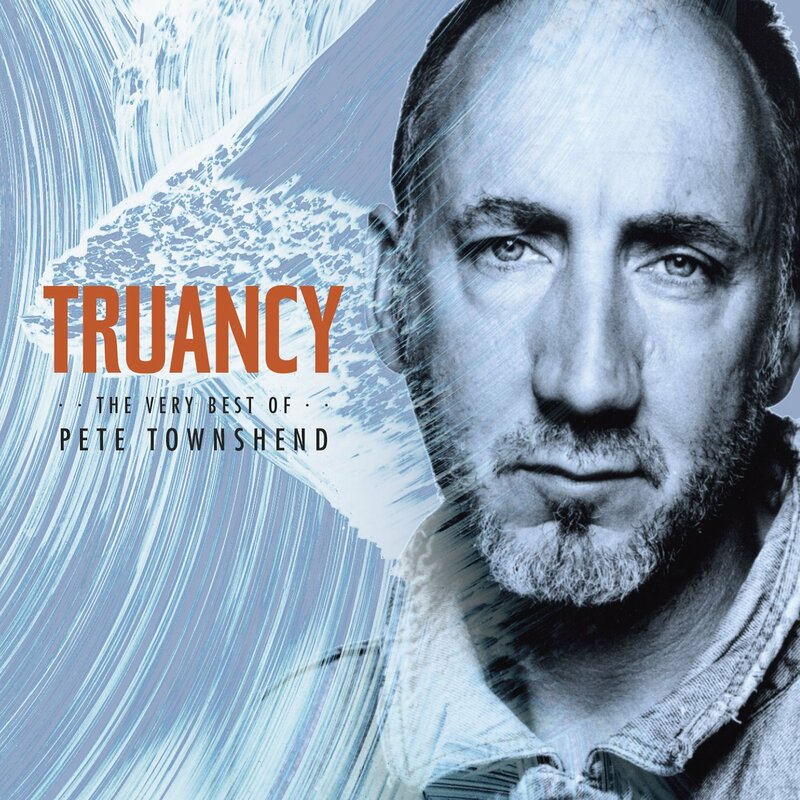 This new release from Pete Townshend and partner Rachel Fuller features collaborations and casual jam sessions with some of today's top artists. With nearly three hours of music, this 3-disc set includes performances from acclaimed shows at Joe's Pub in NYC and The Hotel Cafe in Los Angeles. Release date April 7th 2009. This new DVD includes 17 songs from Roger's "birthday" concert on February 23rd and 24th 1994 at the New York Carnegie Hall where also Pete and John among many others attended this event. In 1994 Continuum already issued a CD with 10 tracks of this source in USA. The material is also available on a 2-CD set, release date is April 3rd 2009 on the Dutch Immortal label. Diese neue DVD enthält 17 Songs von Roger's "Geburtstags-Konzert" am 23. und 24. Februar 1994 in der New Yorker Carnegie Hall, bei dem unter vielen anderen auch Pete und John sich die Ehre gaben. Bereits 1994 erschien in den USA auf dem Continuum Label eine CD mit 10 Tracks aus dieser Quelle. Das Material ist auch als Doppel-CD erhätlich, Veröffentlichungsdatum ist der 3. April 2009 auf dem holländischen Label Immortal. 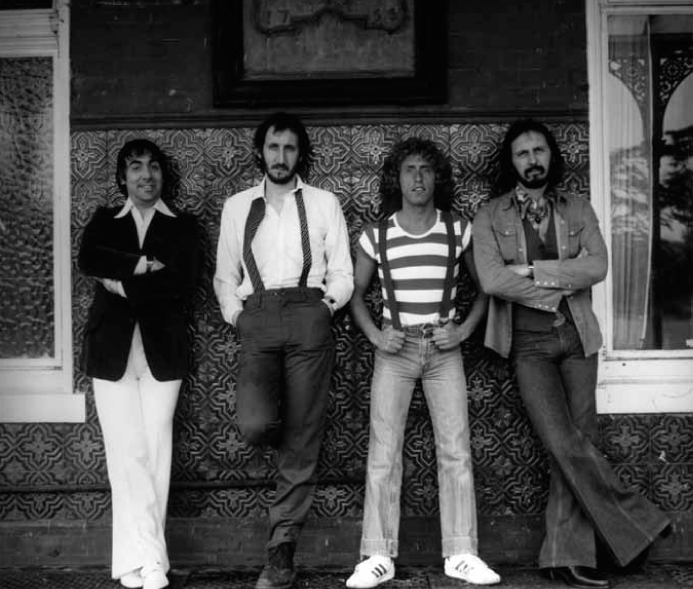 MOJO’s Dave Marsh documents The Who’s early road tours, their eventual mainstream fame, the past and present implications of The Who Sell Out, and the ironies implicit in its creation. Includes exclusive unseen pictures from the sleeve shoot and a side-feature centered on Roger Daltrey. MOJO—On Sale Now. 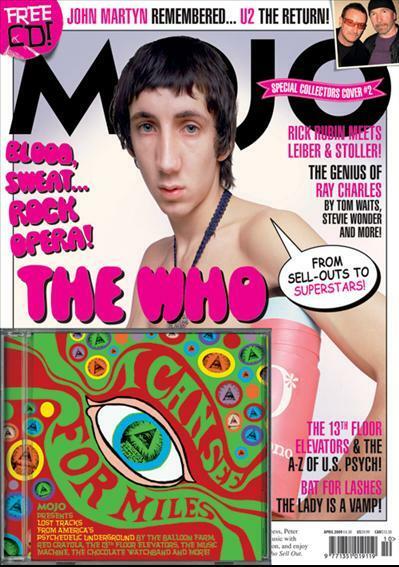 Also, go online at www.MOJO4music.com to view never before seen photos of The Who in 1967, to debate which of The Who’s songs is the "weirdest", to read a blog entry "How The Who Sell Out Bucked the Psychedelic Trend" by MOJO’s Danny Eccleston, and to read an exclusive "The Genius of Pete Townshend" by Pearl Jam’s Eddie Vedder. Stunning reissue of the classic Who album from 1967, now upgraded to a greatly expanded 2-CD version in the acclaimed Deluxe Edition range. Remastered from the original stereo and mono masters for the first time. 28-page booklet contains unseen photos and 1960s period advertisements. CD sleeve features out-takes from the original October 1967 album cover photo session by David Montgomery. Introductory essay by noted rock writer Dave Marsh and in-depth liner notes by Who biographer Andy Neill. Available in the UK on March 16th 2009. Tolle Reissue des klassischen Who Albums aus dem Jahr 1967 in einer erweiterten 2-CD Version der bekannten Deluxe Edition Serie. Erstmalig remastered auf Basis der originalen Stereo- und Mono-Bänder. Das 28-seitige Begleitheft enthält unveröffentlichte Fotos aus den 60er Jahren und die CD-Hülle Aufnahmen der Foto-Session vom Oktober 1967 mit David Montgomery. Vorwort von Dave Marsh und Begleitinformationen von Andy Neill. In Deutschland erhätlich ab 8. Mai 2009. The DVD of 'Maximum R&B Live', first released as '30 Years Of Maximum R&B' on video in 1994, is being reissued worldwide by Universal on March 23rd 2009 in a new package complete with new content, 5:1 sound and a bonus disc of the entire Rockpalast Concert from 1981, previously only seen on TV when first broadcast. The package also contains an interview with Pete Townshend recorded for the Rockpalast concert. Die DVD 'Maximum R&B Live', 1994 als '30 Years Of Maximum R&B' erstmals auf Video herausgekommen, wird nun von Universal weltweit am 23. März 2009 wiederveröffentlicht. Die Neuausgabe erscheint in neuer Aufmachung und mit neuem Inhalt, 5:1 Sound und einer Bonus-DVD mit dem kompletten Rockpalast-Konzert von 1981, das zuvor offiziell nur im TV ausgestrahlt wurde. Darauf enthalten ist auch das Pete Townshend Rockpalast-Interview. Die deutschsprachige Biografie von der verrücktesten Rockband der Welt ist als dreibändiges Werk erschienen. Band 1 umfasst die Anfänge bis 1971 und Band 2 den Zeitraum zwischen 1971 und 1978. Band 3 enthält neben der Band-Geschichte zwischen 1978 und 2009 auch ein Exklusiv-Interview mit Pete Townshend und ist ab sofort lieferbar. The brandnew German Who biography is published as a book in three volumes. Part one includes the history from the beginning to 1971 and part two the period between 1971 and 1978. Part three tells the band's story from 1978 until 2009 and has an exclusive interview with Pete Townshend. Pete Townshend und die Internet-Ermittlung "Operation Ore"
Autor Christoph Geisselhart publiziert hier eine Zusammenfassung von Auszügen aus Band 3 seiner Who-Biografie, um den Ablauf der Ereignisse von 1998 bis 2003 transparent zu machen und die stetig wiederkehrenden Verdächtigungen und Anschuldigungen gegen Pete Townshend dauerhaft zu entkräften. 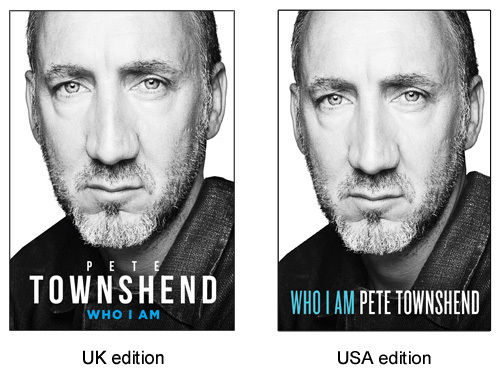 Author Christoph Geisselhart publishes summarizing extracts of the third part of his Who biography here to clarify the sequence of events between 1998 and 2003 and to refute the steady repeats of suspicions and accusations against Pete Townshend. Zusammenfassung über die Internet-Ermittlung "Operation Ore"
WIKING unterstützt das aktuelle Wohltätigkeitsprojekt der Rockband The Who – ein attraktives Sondermodell in ungewöhnlicher Gestaltung macht’s möglich. Das Original dieses VW Bullis wurde nach einem Entwurf von Richard Evans, Art Director der Rockband The Who, lackiert. Wie das Vorbild, das unlängst für 40.000 Euro zu Gunsten krebskranker Jugendlicher versteigert wurde, trägt auch dieses designgleiche WIKING-Modell zum Wohltätigkeitprojekt bei. Erhältlich in vielen Spielzeug- und Modelbauläden. German toys model producer WIKING supports The Who's benefit project for the Teenage Cancer Trust and issued a model of the original Who VW Bus in the scale of 1:87. It is available at toys shops. A new double DVD is released on November 18th 2008. Live At Kilburn 1977 contains the Who's performance before an invited audience at the Gaumont State Theatre on December 15th, 1977. 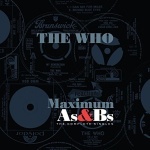 Disc 2 also includes the powerful gig at the London Covent Garden Coliseum from December 1969. The DVD will also be available as BluRay disc. Eine neue Doppel-DVD ist am 13. November 2008 veröffentlicht worden. Live At Kilburn 1977 enthält das Who Konzert vom 15. Dezember 1977 vor einem eingeladenen Publikum im Gaumont State Theater. Auf Disc 2 ist der energiegeladene Auftritt vom Dezember 1969 im Londoner Covent Garden Coliseum zu sehen. Die DVD kommt auch als BluRay DVD heraus. Updated and revised edition of the Who Discography with 5325 entries and 2400 b/w pictures of covers and labels. Überarbeitete und aktualisierte Neuauflage der Who Diskografie mit 5325 Einträgen und 2400 s/w Abbildungen von Covers und Labels. Spanning four decades, this authorized and definitive anthology of The Who relives their journey from humble beginnings to their meteoric rise to rock legend status in a 2-film DVD set. Filled with all-new interviews this must-have collection also features electrifying rare and unreleased concert footage in mind-blowing 5.1 surround sound. Released on November 6th 2007. Aus vier Jahrzehnten erweckt diese authorisierte Anthologie in zwei Filmen die Reise der Who von den ersten Anfängen bis zu ihrem kometenhaften Aufstieg zum Rocklegenden-Status wieder zum Leben. Angefüllt mit komplett neuen Interviews beinhaltet diese unverzichtbare Zusammenstellung auch höchst seltene und unveröffentlichte Konzertaufnahmen im überragenden 5.1 Surround Sound. Veröffentlichung am 6. November 2007, in Deutschland am 13. Dezember 2007.